Built: 15th century (circa 1420). Ownership / Access: Luttrellstown Golf Club House. Notes: Luttrellstown Castle, dating from the early 15th century (circa 1420), is located in Clonsilla on the outskirts of Dublin, Ireland. It has been owned variously by the eponymous and notorious Luttrell family, by the bookseller Luke White and his descendants Baron Annaly, by the Guinness family, the Primwest Group, and since 2006, by JP McManus, John Magnier and Aidan Brooks. The castle has hosted visits by Queen Victoria in 1844 and 1900, and its media profile was raised when Victoria Adams married David Beckham there on 4 July 1999. Luttrellstown and its remaining 560-acre (2.3 km2) demesne currently form a 5-star resort, with a golf course, country club and unique location just outside the city boundaries of Dublin. In 1983 it was sold to the private consortium Primwest, and in 2006, it was bought by JP McManus, John Magnier and Aidan Brooks. 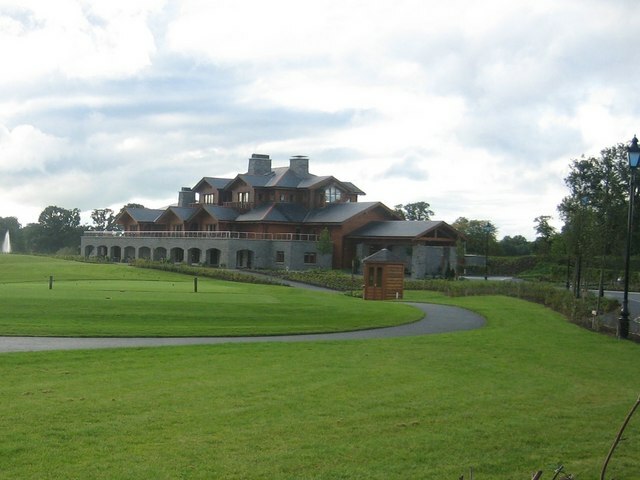 In 2007, more than €20 million was spent on major upgrade work, including improvements to the Steel- and Mackenzie-designed championship golf course and the "alpine style" clubhouse. But late in 2008, it was announced that with under 400 members, the golf course and club would close at the end of 2009. No intention to close the hotel or sell the estate were announced. Golf club members, who said they had been given assurances about the club facilities and continuity, were reported to be "extremely angry and disappointed." The club did not close in 2009 and remains open to date.